Vacation homes in Antwerp for an unforgettable holiday . We offer you the best holiday houseshare. View our array of holiday properties,bungalows, apartments and holiday parks in Antwerp and book your holiday home here. Astoria Hotel is set in the middle of Antwerp’s Diamond District, next to the city park and within 2 km from the historical Market Square with City Hall. Guests can enjoy free WiFi and on-site shops. The Central Train Station is a 6-minute walk. The air-conditioned rooms at the Astoria Hotel come with a TV, a telephone and a safety deposit box. Each unit is fitted with a private bathroom and some rooms also offer a terrace. Every morning, the hotel serves an extensive breakfast buffet including boiled eggs, scrambled eggs, bacon and sausages. Wine and dining is possible in the area around the hotel, within less than a 5-minute walk. The nearest supermarket is one street away. The Astoria also provides a refrigerator with snacks and drinks for common use. Offering free WiFi, B&B Sablon Antwerp is centrally located in the heart of historical Antwerp, a 5-minute walk from the Steen, Antwerp City Hall, Groenplaats and the Cathedral of Our Lady. Rooms come with a private bathroom with a bath or a shower, a hairdryer and a toilet. Bed linen is included. Breakfast can be taken in the room every morning. For lunch or dinner, you can turn to the property’s restaurant, which serves traditional meals with daily fresh products. You can have a drink at the bar or out on the terrace. Packed lunches are available upon request. Holiday Home Den Coninck Achab benefits from a central location in historical Antwerp, a 10-minute walk from City Hall, Town Square, Cathedral of Our Lady and the Meir shopping district. 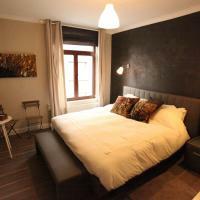 The accommodation is set in a 16th century townhouse and offers free WiFi access. The holiday home is spread out over 3 floors and comprises a living room with a fireplace and a seating area. There is an equipped kitchen where you can prepare meals. The property has two bathrooms, one fitted with a bath and one with a shower. A hairdryer is also available. For breakfast, lunch or dinner you can turn to a wide array of eateries, supermarkets and shops for groceries within an easy walking distance from Holiday Home Den Coninck Achab. Across the street you will find a small park with a children’s playground area. The museum Rubenshuis is 750 m and the Steen is 1.1 km from Den Coninck. The MAS Museum can be reached within a 15-minute walk and the Central Train Station is 1.1 km away. The 500 Hidden Local Secrets. The second book in the fabulous ‘500 Hidden Secrets’ series, this time revealing the beauty of the city. Discover the city’s best-kept secrets, with this practical guide to Antwerp’s’ finest places. A practical guide to discover the finest buildings, restaurants, shops, museums, neighbourhoods, parks, hotels, cafes, art, architecture and people. This fantastic guide will tell you the best places to go for good food, be it lunch, a cheap meal or fine dining as well where to get the best coffee, the best cocktails and the coolest cafes. It will direct you to the best shops, kid’s stores, markets, boutiques and tell you where to buy the latest fashions, accessories, shoes and designer wear. The local architecture is not forgotten as the book guides you to the most beautiful buildings, historical landmarks and parks. The 500 hidden local secrets are listed thematically: food, drinks, shops, fashion, architecture, art, things to do with children, activities among others. Take A Break Holidays takeabreakholidays, Antwerp Accommodation. San Francisco De Asis, Urb Marina, San Fulgencio, 03177, Alicante, Spain.